An introduction training to the Sozo inner healing ministry. This training is best absorbed when used with the Sozo Basic Training Manual. *If group training, we suggest DVDs for best learning environment. 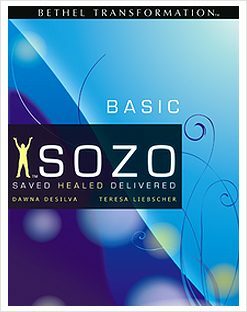 The SOZO Basic Training manual has been revised and expanded and is a great companion to the SOZO Basic Teaching Series. You can use the manual to begin an inner-healing ministry, teach a personal restoration class, or for your individual growth and development. This manual is best for use alongside the DVDs and CDs and not independently of them. Dawna De Silva is the founder and co-leader of the International Healing and Deliverance Sozo Ministry birthed at Bethel Church. Whether training Sozo, shifting atmospheres, or ministering prophetically, she releases people, churches, and cities into new vision and freedom. No matter how traumatic the wounding, Dawna ministers with authority and gentleness, imparting hope and healing. Teresa Liebscher founded and has led the Shabar Ministry of Bethel Church since 2002. She is now offering training for the Shabar ministry. Teresa is a leader of the Transformation Center at Bethel, and has been a teacher of the Sozo Ministry since 1997. She has been traveling and teaching Sozo Basic and Sozo Advanced seminars since 1998, and has recently been on the teaching team for Children’s Sozo. Her passion for connecting the body of Christ to Father, Jesus and Holy Spirit is an ever-increasing love of her life.